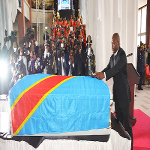 Papa Wemba was buried on Wednesday in Kinshasa, after three days of official mourning period. 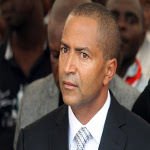 His remains will be moved in the coming days to a mausoleum being built in his honor, the governor of Kinshasa, Andre Kimbuta, announced during a funeral mass at the Notre Dame of Congo Cathedral. President Joseph Kabila has posthumously awarded Papa Wemba the title of Grand Officer of the National Order. 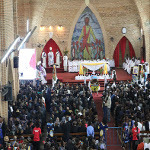 “We elevate you posthumously to the rank of Grand Officer of the National Order of the Kabila-Lumumba national heroes for your merits, and your loyal and distinguished services to the Congolese nation,” Joseph Kabila said during an official ceremony honoring Papa Wemba on Monday. Iconic Congolese musician Papa Wemba died on Sunday in Abidjan, Ivory Coast, where he was performing at the Urban Music Festival of Anoumabo (Femua). He collapsed on stage, his spokesman Henry Noel Mbuta Vokia told Radio Okapi. 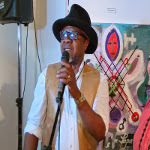 Papa Wemba, born Jules Shungu Wembadio is one of the greatest icons of Congolese music. 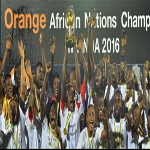 A brace from Mechak Elia and the other by Jonathan Bolingi was all DR Congo needed to beat Mali 3-0 in the final on Sunday and cruise to their second African Nations Championship (CHAN) title. 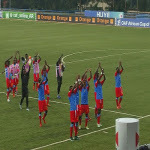 Elia scored in both halves before Bolingi sealed victory with the third later as the Leopards confirmed their status at the most successful side in the history of the tournament designed exclusively for footballers playing in their domestic leagues. 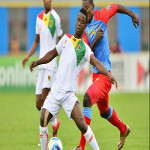 DR Congo edged Guinea 5-4 on penalties to reach the final of the African Nations Championship for the second time. 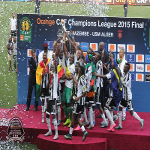 The Congolese, winners of the maiden edition in 2009 in Cote d’Ivoire, were on the brink of victory after TP Mazembe forward Jonathan Bolingi headed them into the lead in extra time, only for Guinea to draw level with virtually the last kick through Ibrahima Sory Sankhon. DR Congo cut short the campaign of host Rwanda beating them 2-1 in their quarter-final clash on Saturday in Kigali. Central defender Padou Bompunga headed home the winner in extra time as the Congolese eased into the last four for the first time since 2009, ending the hopes of Amavubi, who gave their all yet not enough. 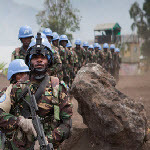 Democratic Republic of Congo's army and U.N. peacekeepers agreed Thursday to resume military cooperation against Rwandan Hutu rebels, the U.N. mission said, beefing up efforts to root out one of the region's most notorious rebel groups.